Rediscover youthful-looking skin with NuFACE Gold Mini Express Skin Toning Collection. The must-have skincare regimen combines an award-winning, limited edition microcurrent facial device with triple-action face wipes and an anti-aging primer. Arrives with a gold-painted clutch bag. A mini, FDA-cleared microcurrent treatment device offering all the benefits of a microcurrent treatment in a portable size. Addressing visible signs of aging, the device expertly stimulates large surface areas and small contours of the face, creating similar results to a facelift. Pain free and quick to use, the mircrocurrent device mimics the natural current of the body, which slows as we age, and helps to visibly tone, improve facial contours and even out the appearance of skin tone while visibly reducing the look of fine lines and wrinkles. With limited-edition spheres dipped in 18K rose gold. Safe and effective for all skin types. A pack of triple-action face wipes that effectively clean, exfoliate and hydrate your complexion. Each dual-sided, individually wrapped face cloth features a soft cotton lace side to gently remove makeup, dirt and impurities, and an exfoliating side to delicately buff, polish and refine skin. 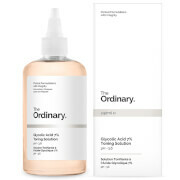 A cocktail of Hyaluronic Acid, antioxidants and minerals refresh and brighten the face, while anti-aging ingredients help to smoothen to promote a radiant, younger-looking complexion. Skin feels soft, clean and purified. 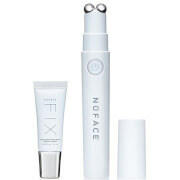 A lightweight, leave-on formula that preps skin to receive the NuFACE Trinity Device. 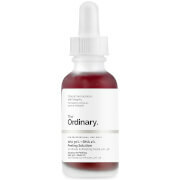 Promoting maximum results, the anti-aging formula helps to deliver an optimal facelift effect. It contains a 24K Gold Complex comprising Hyaluronic Acid, Peptides, Gold and Algae extracts, and firming ingredients DMAE and Alpha Lipoic Acid to tighten and tone the appearance of skin. The primer allows the Trinity device to glide easily over skin and ensures maximum microcurrent conductivity for improved efficacy. Fitted with a built-in brush for mess-free application. Free from parabens, oil and fragrance. 1. PREP: Cleanse skin with Prep-N-Glow® dual-sided cloths and apply 24K Gold Gel Primer Firm. 2. LIFT: Glide the NuFACE Trinity® along the natural contours of face and neck, avoiding the midline of the neck. 3. FINISH: Massage remaining 24K Gold Gel Primer Firm into skin. Ferment, Glycerin, Sodium Citrate, Vitis Vinifera (Grape) Seed Extract, Aristotelia Chilensis (Maqui Berry) Fruit Juice, Glycyrrhiza Glabra (Licorice) Root Extract, Ginkgo Biloba Leaf Extract, Carya Ovata Bark Extract, Fragrance/Parfum, Butylphenyl Methylpropional, Hexyl Cinnamal, Linalool, Benzyl Salicylate, Hydroxyisohexyl 3-Cyclohexene Carboxaldehyde. Primer: Water/Aqua, Propanediol, Hydrolyzed Hyaluronic Acid, Algae Extract, Palmitoyl Tripeptide-1, Palmitoyl Tetrapeptide-7, sh-Oligopeptide-1, Dimethyl MEA, Thioctic Acid, Vigna Aconitifolia Seed Extract, Phenoxyethanol, Carbomer, Sodium Hydroxide, Hydroxyethylcellulose, Magnesium Sulfate, Caprylyl Glycol, Ethylhexylglycerin, Glycerin, Butylene Glycol, Maltodextrin, Sodium Lactate, Polysorbate 20, Sodium Chloride, Trehalose, Gold (CI 77480). I use a variety of beauty apparatus, or most like NuFACE, it can help me lift the skin, remove edema, and the effect is very significant. For everyday use, mini is enough, and it is easy to carry. The color of this new product is very beautiful. I prefer this pink to the pure white one.